I'm having a bit of a love affair with nut butter lately. Yeah, my cereal bowls might be a little jealous, and those oats in my cabinet might be wishing I'd mix up an overnight concoction or two. So when I saw this almond butter-based breakfast during my trip to Austin, my heart eyes just couldn't control themselves. Must. Eat. More. Nut Butter! 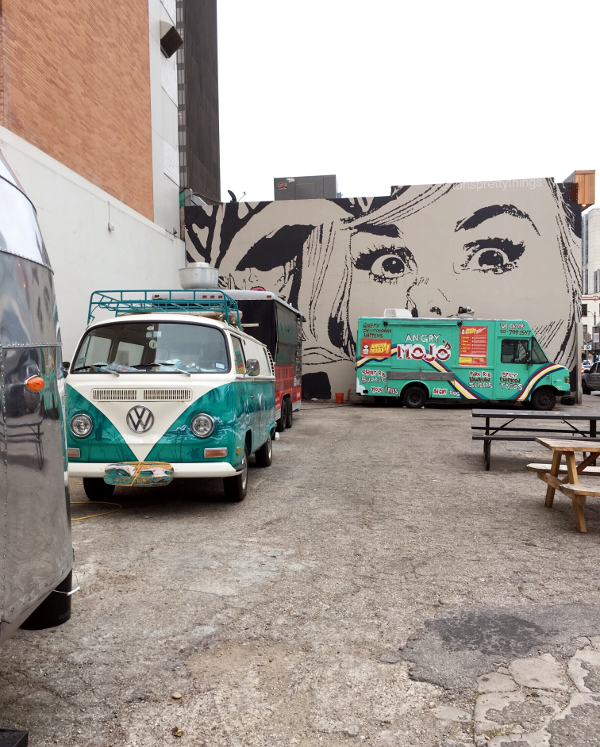 In fact, my coworkers and I loved the My Name is Joe food truck so much, that we spent two of our three Austin breakfasts here. And you know what? 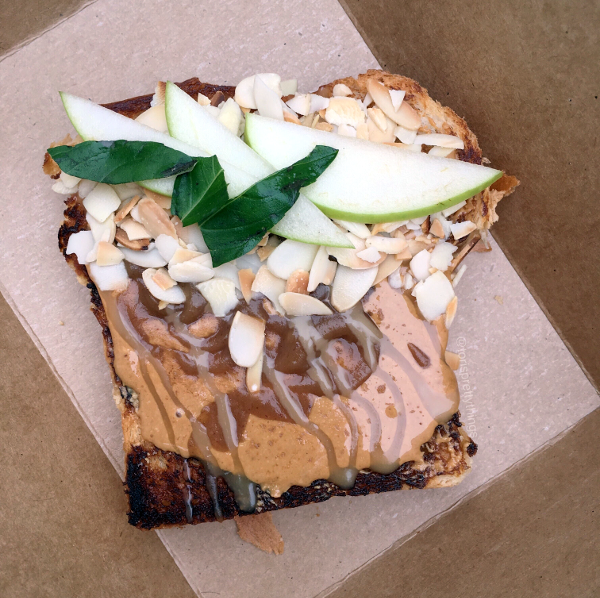 I got the Almond Butter Toast both days. And I regret nothing! Would you just look that deliciously melting almond butter?! Ugh, warm nut butter is just SO good. 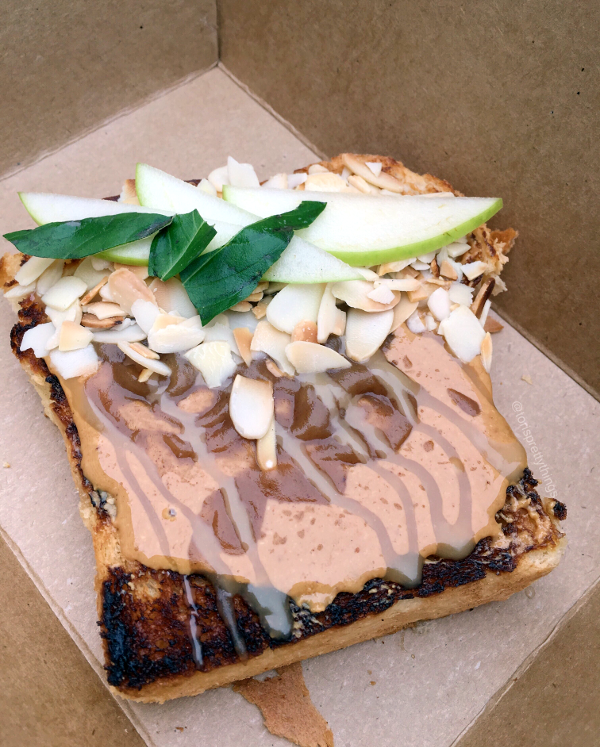 Plus, that apple jam and miso butterscotch on top really took the flavor to the next level of yum. Slapped on top of the most delicious bread (that I'm pretty sure was Challah?) and piled high with apple and almond slices, I felt like I died and went to Breakfast heaven :). You know what was really nice, though? 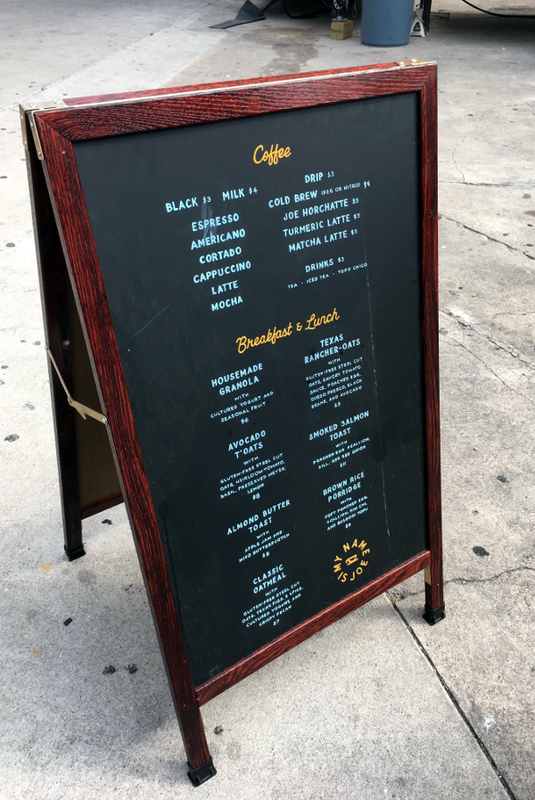 Yes, it's great to eat at a food truck with quality ingredients, and drink coffee that really wakes a gal up in the morning. It's even better, though, to feed both my tummy and my soul by eating somewhere dedicated to making a difference in their community. I'm a true Millennial in that way. I want to eat and do good. So this truck fills both, by working to help those who are down and out get back on their feet. Not only was this spot really cool and super yummy, but they're doing something really cool too. So my overall recommendation? If you're in downtown Austin, then all signs point to go! Grab yourself a yummy, healthy, quality breakfast there, and feel good in your soul that you're also giving to a good cause :).